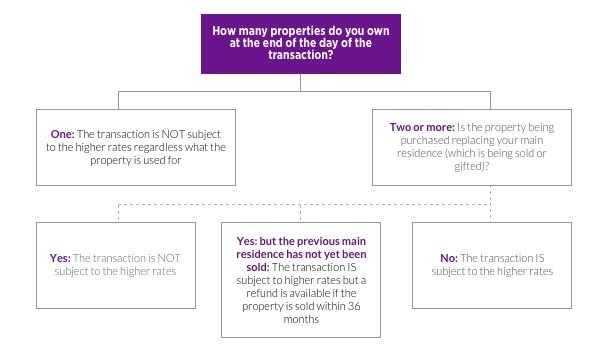 We are continually getting asked about stamp duty for buy-to-let so here is a very useful Q&A courtesy of Zoopla. A. Anyone who is buying an additional residential property. This could mean a holiday home, buy-to-let or even a main residence you plan to live in (more detail on this later). Even if you already own just a share in another property, it will count (so long the share is worth more than £40,000). Properties anywhere in the world are considered too. So, if you own a 30% share of a £300,000 ski chalet in Bulgaria and are buying your first home in the UK, you’ll be stung with the extra tax. The higher rate Stamp Duty applies to the purchase of property in England, Wales, Northern Ireland and – under a separate announcement in the Scottish Government's 2015 pre-election Budget – in Scotland too. A. The new surcharge took effect from 1 April, 2016, but it was first announced in the Chancellor’s 2015 Autumn Statement Spending Review. To avoid paying it, you'd have had to complete (not just exchange) on any second home purchase by midnight on 31 March, 2016. (Unless you'd already exchanged on or before 25 November, 2015, the date when the new tax was announced in the Chancellor's Spending Review). But replacing your main residence means the last one will need to be disposed of (ie, SOLD or GIFTED). If you are moving out of rented accommodation (or, say, your parents' home) this will NOT count as disposing of your main residence as your name is not on the property deeds. The refund applies, in fact, to the sale of any property that has been your only or main residence at some point during the three years leading up to the purchase (ie, you don't have to be moving directly out of one main residence and in to the new one). How long you lived in a previous main residence will not be relevant. A. You’ll need to complete one of HMRC’s repayment request forms and submit it within three months of the sale. Until an online version is available, you’ll have to print off this form and post it to HMRC’s Birmingham Stamp Office. HMRC says it aims to process all repayments within 15 working days of receiving the information requested. Payment, if successful, will then be issued by payable order. If you are not successful, HMRC will write and explain why. A. In some cases, (for example, if you are moving back to the UK after living abroad), you may have to sell your main residence but move into a 'stop gap' before you can buy a new one. In this case, the Government will offer a 'grace period' of 36 months (increased from 18 months in the March Budget) during which time the purchase of your next main residence will NOT be subject to the 3% surcharge. To make it fair to people who had already sold their main residence before the Autumn Spending Review when the higher-rate tax was announced, the 36 months will start ticking from 25 November 2016 and not from the date of the sale completion. Q. What if I already own a property, but I'm buying with someone who doesn’t? However, so long as you are NOT married, you can get around this by putting the new home in the other person's name (ie, the one who does not already own). HMRC has now confirmed to us that this will NOT be regarded as tax avoidance. One problem with putting a new home in just one person's name is satisfying the lender's affordability criteria. But Ray Boulger, senior technical director at mortgage broker John Charcol, said that some banks including Metro Bank and The Woowich allow two names on the mortgage agreement but just one name on the property deeds. Q. What happens if I've split from my partner but my name's still on the deeds of our home? A. If you are separated or getting divorced and want to buy a new home to live in but your name is still on the deeds of your previous home (which is NOT being sold), this will constitute buying an additional property which means the 3% surcharge will initially apply. However, if you go onto sell your share of the home back to your former partner (or sell the home entirely) within 36 months of completing, HMRC will provide a full refund. See above for how this refund should be carried out. Q. I'm separated but still legally married. Will I be still be linked for tax purposes? A. The Government confirmed that married couples who are living separately in circumstances that are likely to become permanent will NOT be treated as one unit for the purposes of the 3% surcharge. In other words, if you are buying a home that only incurs the 3% surcharge on the basis of your legal spouse's situation, you won't have to pay it. Q. I have a second home but want to buy more shares in the one I live in. Will I be affected? A. Purchasing additional interests in your existing home may be subject to the higher rates if you own other properties on the date of the purchase. Similarly, transferring an interest in a property to your spouse (perhaps to put them on the mortgage agreement) can result in the charge. Again, the higher rates will only apply where additional properties are owned at the time of the transaction. A. The Government has a keen eye on preventing tax avoidance with this levy, so you won't be able to escape the surcharge by setting up a limited company for the purpose of buying an additional home or homes. Q. What if the home I want to buy has a 'granny annex'? The Treasury explained: "Under the new rules, if you buy a main residence (either your first property or a replacement for a previous main residence) worth £250,000 and an annex capable of separate sale worth £50,000 in a single transaction, Stamp Duty at the standard rates will be charged on the total value of £300,000. If you are purchasing at least 6 dwellings however, you can choose whether to pay Stamp Duty at non-residential rates or claim multiple dwellings relief. If you choose to claim multiple dwellings relief, the higher rates will apply – the minimum rate payable being 3% for purchases up to £125,000. No Stamp Duty is payable on properties that are inherited, so the 3% premium will not be relevant. That said, if you have inherited a property and go onto purchase an additional home without selling it, you will be hit with the surcharge. A. You won’t pay the 3% Stamp Duty surcharge on additional homes that cost less than £40,000 (see 6 homes on Zoopla for under that budget), or on caravans, mobile homes and houseboats. The purchase of a non-residential properties (such as offices or warehouses) will not attract the higher rate tax. Neither will they cause a purchase of a dwelling to be liable at the higher rates. The purchase of a mixed-use property (a flat above a shop for example) will not attract the higher rate tax. But if you already own a mixed-use property and want to buy an additional property, it will be considered for the higher rates. Social landlords and charities won't be liable for the 3% loading. A. An overseas timeshare home will only be considered for the purposes of the higher rate Stamp Duty if it is a dwelling AND you have a share in ownership which is equivalent to either a freehold or a lease with a term of more than seven years. However, as many timeshare deals are contractual agreements to occupy a property that is owned by another person, this will not be relevant. Q. What about other homes specifically designed for holiday use? A. Holiday homes – even if they are furnished holiday lets or they come with restricted use during the year – will be treated the same way as any other additional property purchases. A. HMRC has instructed the country's solicitors and property lawyers to ask buyers the question outright of whether they already own another property. If you don’t answer truthfully it’s tantamount to fraud – penalties for which could be a lot worse than a 3% Stamp Duty loading. Yes. The final policy design was announced in the Chancellor's Budget on 16 March and it kicked in as planned on 1 April 2016. Q. I need help working out whether the higher rate Stamp Duty is due. What should I do? Telephone: HMRC Stamp Duty helpline on 0300 200 3510 (lines open 8.30am to 5pm). Tweet: @HMRCCustomers with your query (account is serviced bewteen 8am and 6pm). Be sure not to disclose any personal details on social media.